Nice review, Vinnieh. This film has been a favorite and ranked in my top 10 favorite films. I marvel at the brilliance of Cate and the ensemble cast which creates the Machiavellian tone of court. The costumes, the cinematography, the gorgeous coronation, the ladies, the dancing, the Thames party scenes–all of it. A perfect film. Thanks Cindy, the court intrigue is so well rendered and the visual style is just so breathtaking. Blanchett, Fiennes, and Rush. You can’t go wrong with those three working together. Fine review. Thanks Keith, definitely a talented trio who all deliver great work. If there was any justice this would be Blanchett’s first Oscar win. She is splendid here. The film was terrific too, a shame the sequel is only worth seeing for her work and the costumes. Thanks Sati, yeah Blanchett should have definitely won for her work. Gotta love Cate Blanchett. She’s always been one of my favorite actresses. She’s one of my favourite actresses as well. Another fan of Cate Blanchett here. 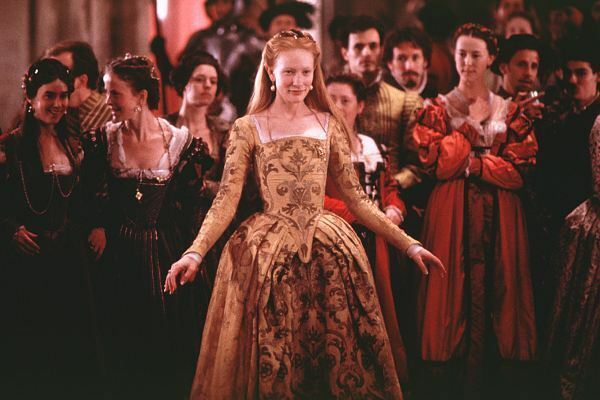 She provided the most plausible interpretation of the historical Elizabeth I’ve ever seen, on stage, big screen or small screen – and Elizabeth is a crucial protofeminist icon, combining intellect, passion, politics, personal sacrifice, image manipulation. As historical fiction, Kapur’s vivid version of the woman into Gloriana story has wonderful vigour and sweep, and danger; shame about the limp sequel, as already said. Historical costume drama is a dodgy genre – I think non-English speaking cultures bring history to life better than UK and Hollywood. Only the seminal Gladiator can hold its own. Likewise, the best Jane Austen film (apart from Clueless) is Ang Lee’s Sense and Sensibility (though scripted by English queen Emma Thompson of course). Thanks for commenting, I just love this interpretation of the famous Queen. It doesn’t get much better than this. I rarely use the word, but it is a ‘perfect’ film, in every sense. I’m in complete agreement, this movie is flawless. Blanchett’s performance is absolutely stunning.